At first glance, Walki’s biomass cover doesn’t look very high-tech, but it’s an ingenious invention that very efficiently improves the energy content in logging residue. The cover itself is a four-meter wide laminate, mainly produced from renewable fibrous materials. It shelters the top of the pile but leaves the sides open, allowing moisture to evaporate. “The biomass cover is already the widest of its kind on the market and the production is constantly growing. Now we are also developing a six-meter wide version that can cover even bigger piles of logging residue and other wood-based biofuels,” says Hannu Nieminen, Product Line Manager at Walki. In addition to shielding the residue from water and snow, the biomass cover also protects the residue from freezing, which can transform the pile into an icy heap that’s almost impossible to handle and has low energy content. Finland and Sweden are pioneers in harvesting energy wood, but because energy saving and biofuels are the latest buzz, interest in the technology is increasing in other parts of the world as well. “Energy wood is, in many countries, an almost unused resource for producing energy in an environmentally sound way,” says Mr. Nieminen. 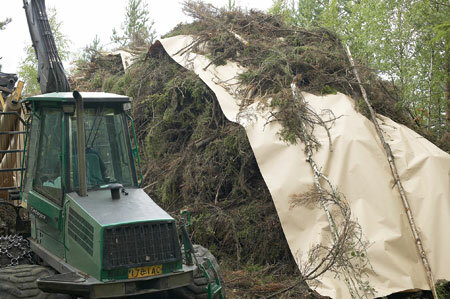 “Our product maximizes the energy value of logging residue; measurements have shown that the solids content of wood can be raised by as much as 15% by using the cover.” In Finland, the main reseller of Walki’s biomass cover is Uittokalusto Oy, a Finnish company owned by Grube KG Forstgerätestelle of Germany. The company has been selling the cover for about five years now and is very pleased with the feedback from customers. 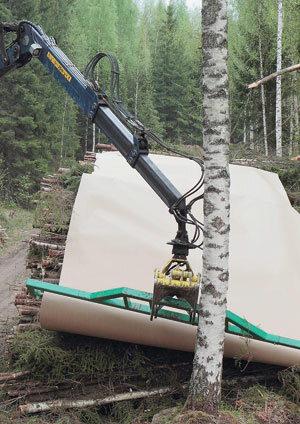 The main customers are big forest companies in Finland and their subcontractors.